The Wandsworth Borough News of 23rd June carried the story ofJames Bartaby of Bedford Hill, with the headline “Balham Youth’s Heroism”. He was 15, but at 13 and 7 months he had enlisted in the 7th East Surrey Regiment and reached the trenches before he was 14. Three months of training in England had not shown up that he was underage, and he spent nine months in the trenches before he was wounded by shrapnel. In hospital they realised that he was underage and sent him home. This did not put James Bartaby off his desire to join up. He ran away and joined the 3rd East Surrey Regiment, and had nearly finished his training before his mother discovered where he was and alerted the authorities. A letter from her reached Dover as he was starting for France and he was once again sent home. 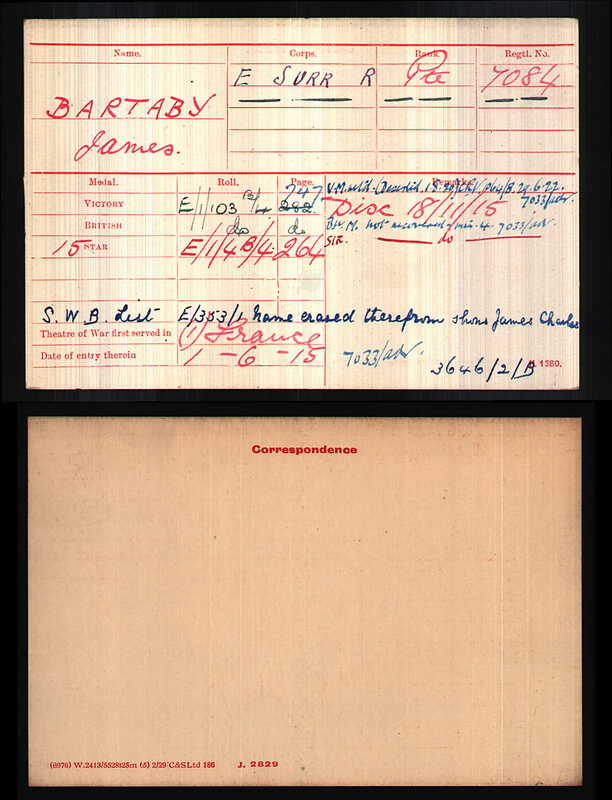 A medal card for him shows that he was discharged on 18 November 1915, having entered France on 1st June 1915. Trying to find out more about him is difficult, as the only James Bartaby coming up on the 1911 census is from Doncaster, the 8 year old son of Walter and Jane – a Walter Bartaby is listed at Cavendish Road in the 1915 Kelly’s directory, but his census entry shows that he and his wife only had daughters living. 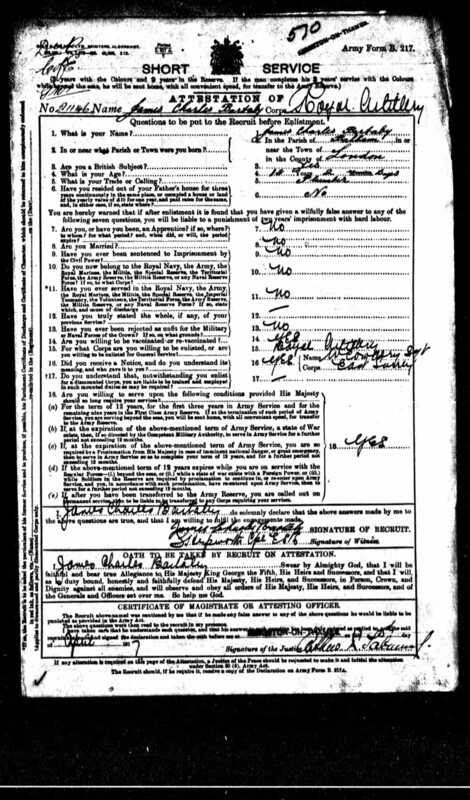 James’s army pension form is available on Ancestry, showing that he claimed he was 18 (and 2 months) and a plumber. He appears to have made several attempts to join up – some of the details are from 1917 – so having been brought home this week in 1916, and injured in 1915, obviously didn’t put him off trying to serve.